Several types of biomaterials are used to replace the damaged joints. However, their longevity cannot be compared with that of natural joints, and this issue remains a challenge for engineers and scientists. Among the various biomaterials, the ultrahigh molecular weight polyethylene (UHMWPE) as acetabular cup and chromium cobalt alloy (CoCrMo) as femur head is considered a gold standard for joint replacements (Figure 1, right side). Figure 1. Illustration of motion profiles in a conventional pin-on-plate tribometer and hip joint with acetabular cup (UHMWPE) and femoral head (CoCrMo). The wear rate of UHMWPE in this tribometer cannot resemble that of acetabular cups made of UHMWPE. The service life of such joints is largely dictated by the wear resistance of UHMWPE. Since UHMWPE is soft, it can produce large-sized wear debris, resulting in an infection and revised surgery. Hence, the wear resistance of UHMWPE needs to be improved. Several methods can be used to achieve this, such as the cross-linking of polymer chains, treating with antioxidants (Vitamin E) and applying hard face coatings on UHMWPE (ceramic or carbon coatings), and better sterilization process (gamma irradiation and ethylene oxide). Thus, a reliable wear testing instrument is required for screening or evaluating the best UHMWPE treatment methods. The wear can be tested by two methods: pin-on-plate tribometer (also known as material test), and hip/knee joint simulator (also known as component test). However, a simulator cannot independently assess the effect of material properties or design in the wear of artificial joints. A pin-on-plate tribometer also cannot investigate the effect of design effect, but it is commonly employed to select the low-wear materials for the artificial joints. Extreme caution needs to be taken prior to using a traditional pin-on-plate tribometer for screening the biomaterials such as UHMWPE, as the linear reciprocating motion of the pin-on-plate can produce wear rate that is two orders of magnitude smaller than the in vivo wear rate (10-6 mm3/cycle). Unidirectional sliding or linear reciprocating makes the polymer chains to align along the direction of motion. This results in strain hardening along the sliding direction and low wear. This type of preferential orientation is not possible in in vivo due to multidirectional motion (and cross shear) during the gait cycle (Figure 1). This disadvantage in the traditional pin-on-plate with unidirectional motion is resolved by the Ducom Biotribometer. Figure 2 shows the anatomy of Ducom Biotribometer. This tribometer is capable of automated loading system (producing dynamic load profiles), multidirectional motion (X axis sliding, Y axis sliding, pin rotation), and friction and linear wear measurements. While the multidirectional motion in Ducom Biotribometer can increase the wear rate of UHMWPE as compared to the unidirectional motion, its use in screening of a variety of UHMWPEs has not yet been studied. 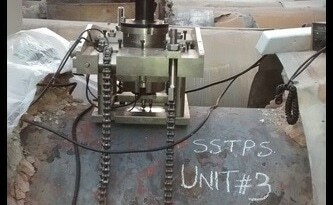 Ducom Biotribometer with multidirectional motion (rotation + sliding) and dynamic load profiles (similar to gait load profile) was employed to estimate the wear of UHMWPE pin in contact with either Ti6Al4V disk or CoCrMo disk. Figure 3A shows that the wear volume of UHMWPE increased linearly over an increase in the number of cycles up to 1.2 million cycles (MC). At the end of the test (1.2 MC), the wear of UHMWPE in contact with Ti6Al4V disk (43 mm3/MC) was 35% higher when compared to that of the CoCrMo disk (Figure 3B). Figure 3. Linear relationship between wear of UHMWPE and number of multidirectional sliding cycles (A). Cumulative wear of UHMWPE in contact with CoCrMo disk and Ti6Al4V disk (B). The high-wear UHMWPE contacting the Ti6Al4V disk had severe fiber pull-out (or delamination), a polished surface, and deeper cracks. Figure 4 shows that there were also more scratches on the Ti6Al4V disk in comparison to the CoCrMo disk. Figure 4. Scanning electron microscopy of worn UHMWPE and optical microscopy images of worn CoCrMo and Ti6Al4V. Top and bottom row represent the wear of UHMWPE in contact with CoCrMo and Ti6Al4V, respectively. These images represent different types of wear mechanism in UHMWPE. As shown in Figures 5A and 5B, these surface characteristics typically represent damaged UHMWPE cups, either retrieved from the patients or from the joint simulators. Figure 5. Similarity in ripples formed on the worn UHMWPE obtained from the retrieved implants, hip simulator and Ducom Biotribometer (A). Similarity in the multidirection scratches formed on the stainless steel femoral head retrieved from the implants, CoCrMo femoral head from the joint simulator, CoCrMo disk from the Ducom Biotribometer (B). In a second study, the Ducom Biotribometer was employed to distinguish the crosslinked UHMWPE from the uncrosslinked UHMWPE, in contact with CoCrMo disk. Figure 6A shows that the wear rate of the crosslinked UHMWPE (0.64 mm3/MC) was almost an order of magnitude lower in comparison to the uncrosslinked UHMWPE (5.19 mm3/MC). Figure 6B shows that the friction coefficient was higher for the crosslinked UHMWPE in comparison to the uncrosslinked UHMWPE. Figure 6. Wear rate (A) and friction coefficient (B) of crosslinked UHMWPE and uncrosslinked UHMWPE, in contact with CoCrMo disk. The standard deviation indicates repetition of the experiment on three different stations in Ducom Biotribometer. 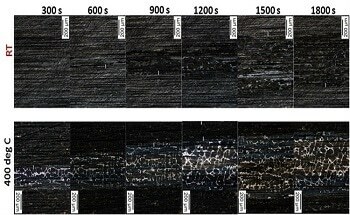 The optical microscopy images of the worn surfaces demonstrate the severity of scratches on the uncrosslinked UHMWPE and its counterpart, the CoCrMo disk (Figure 7). It can be concluded that the wear test conducted in Ducom Biotribometer has yielded results that are closer to the clinical study and simulator, as shown in Table 1. Therefore, the Ducom Biotribometer with dynamic load profiles and multidirectional motion is considered to be a vital screening tool during the development of products in the medical device sector. Table 1. Comparison of wear rate and mechanism for UHMWPE as determined by simulator, retrieval study and Ducom Biotribometer.